Here I will unravel the mystery surrounding Pancakes Crepes Pannekaker. Not only do the French make them, they are made in many parts of the world and have many names. In our family, we call them pannekaker, but we are a bunch Norwegian Vikings, and wouldn't dream of calling them crepes - HE-HE. powder and can be served for breakfast,lunch or dessert. Fill them with anything from your favorite berries to seafood. Have a a lovely breakfast get-together, and let your guests bring their favorite fillings. After showing a couple of fellows how to flip the crepes, you can sit back and relax. Neat-EH? Sometimes I make Norwegian pannekaker for lunch and serve them with fresh blueberry sauce and bacon. Yummy! Whisk together ingredients until you have a smooth batter. Let batter rest 15-20 minutes in the refrigerator. Whisk again before baking. frying pan (8-10") works well. 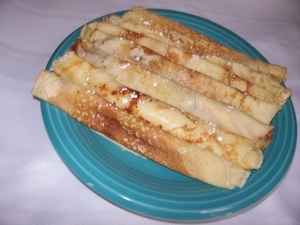 You don't have to run to the store for a special pan to make pancakes crepes pannekaker. Distribute Canola or olive oil in the pan using a silicon brush or paper towel. I like using a paper towel because it soaks up excess oil - you can keep using the same towel until you are done. Use spatula (cake decorating knife which has a rounded tip). Go around edges to loosen from frying pan - insert spatula under crepe to turn it. They cook fast so you have to watch them carefully, otherwise they will burn. They should be light golden in color. Place pannekaker on a plate to fill later. Stir together: cottage cheese sour cream, cinnamon and sugar. Spoon this mixture on pannekake. Finish with 1 tablespoon or two whip cream. Make into rolls and serve. Place filling between each layer and top with whip cream, sour cream or yogurt and delicious berries - looks beautiful and taste even better. Cut into pie shapes for serving. 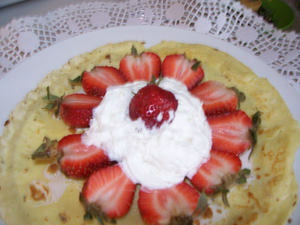 Why not invite your friends to a pancake crepes pannekake brunch. Perhaps a selection of seafood salads or spreads would please their taste buds, such as made with crab meat, shrimp, salmon or halibut. Halibut sauteed with onions, green and red pepper and/or other vegetables is a delicious filling. An egg omelet made with smoked salmon, scallions and dill is an other taste-pleasing filling. Other options are to serve filling made of chicken, turkey, beef, pork, there are tons of variation. Utilize foods you already have on hand. These pancakes may be made up ahead and filled later. Also they freeze well, filled or not. 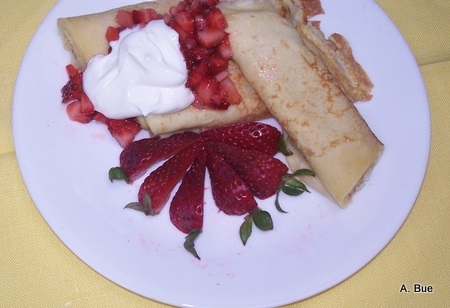 Wondering if pancakes/crepes/pannekaker are delicious? You bet - they are terrific.